My children LOVE monkeys. One of their favorite monkeys is the well known CURIOUS GEORGE. They watch the cartoon every morning on PBS Kids. I have never seen a Curious George mural, so I decided to do a little searching on Google to see what I could find. I found a few ideas that are actually super easy to do because they are done with wall decals. But Curious George is not the only cute and lovable monkey. There are so many more cute monkey ideas that you can bring into the baby nursery. I found this one on www.joelenbakes.blogspot.com. It seems the author used this picture as their inspiration for planning their baby nursery. I am not sure where they found it, but it is adorable! Not sure if it is hand painted or wall decals, but it is cute either way. Monkey themed baby nursery murals are another adorable theme option for both baby girls and boys. My favorite is definitely the monkeys hanging from the trees. A perfect addition to any nursery decor. Decals are great, but being a mural painter myself, I definitely suggest doing something hand painted. And yes, you can do it! You have come to the right place to find ideas and inspiration! I have yet to paint a mural in a hospital, but have always wanted to. I have seen lots of murals done in hospitals that I have gone to and I especially love to see murals in the pediatric departments or children’s hospitals. I think a hand painted wall mural in a children’s hospital is so special. I cannot imagine the struggles that some children go through with numerous illnesses, some even life threatening. And what better way to take your mind off of the pain than to let your imagination get lost in a beautiful wall mural. Over the next few posts, I may focus on hospital murals because I really find them so inspiring. Baby nursery murals are great too, but only a limited amount of people are able to enjoy. In a hospital, hundreds of people come through on a daily basis. In this post I am showcasing Under the Sea / Under the Ocean hospital murals. The first image above was done by Carol Hawkins Studio for the St. David’s Hospital in Austin Texas. I love the vibrant colors! This next mural was done by Wayne+Deitz Design Group for a Children’s Medical Center. This mural was done for the Woman’s and Children’s Hospital in Louisiana. I am not sure who it was done by. I found it on the Woman’s Foundation, Inc. Site. This is a mural that was done on canvas by the Nebraska Art Department for the Summerlin Hospital Children’s Ward. It looks so realistic! The next 2 murals are my favorites! They were also done by the Nebraska Art Deparment for the Summerlin Hospital. If you are an artist who has painted a children’s hospital mural and would like to showcase your work, please contact me. I would love to here about what inspired you and how you felt while painting. I decided to take a quick look around one of my favorite sites that is jam packed with nursery mural inspiration – Design Dazzle.com. I came across a gorgeous mural done by Heidi Ingersoll, owner and artist of Posh Paint Designs. I LOVE how she uses soft colors in the mural and frames it with a scroll border. It looks like a window within the striped wall looking out at the carraige and landscape. The mural itself is simple, but the clean lines and shading are just perfect. I went searching for more mural ideas with the Cinderella theme and came found this outrageous little girl’s room that was obviously done for some kind of celebrity. After reading the article, I read that it was done in a football player’s home. Read more about it here. This last mural was done by www.cjpmurals.com. The blue paint color against the white is beautiful. And the Cinderella mural is so creative with the simple carriage design. My favorite part of it is the use of glitter. That just transforms it into something truly magical. So, if you are planning on decorating your little girl’s bedroom or nursery, feel free to use these beautiful pictures as your inspiration. This is the reason I started this blog as a place where new parents can come and get inspired! Do you have a favorite Nursery Design? Please share!! 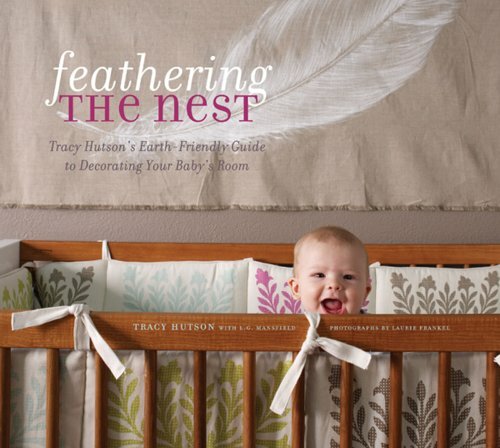 And don’t forget to check out this great book about baby nursery decorating!